Astronaut, Ron Garan, snapped this photo of Hurricane Irene from aboard the International Space Station on August 22, 2011. NOAA averages are based on data from 1981-2010. AccuWeather’s 2012 Atlantic Hurricane Season forecasts 12 named tropical storms, five named hurricanes and two major hurricanes. 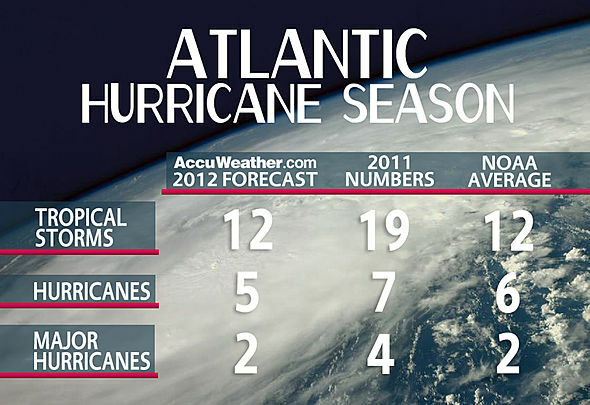 The 2012 hurricane forecast is near-normal for the Atlantic Basin. Predicting exactly where storms will make landfall in the U.S. would be extremely difficult, but there are some indications of areas where storms may brew and coasts that may be vulnerable based on weather patterns anticipated this summer. “Home-grown” storms in the western Atlantic and Gulf of Mexico, near the U.S. Coast, are a possibility this year. “Fronts coming down during June and July could cause energy to break off and develop tropically,” Paul Pastelok, AccuWeather.com lead long-range forecaster, said. Although the overall forecast numbers for 2012 are lower than 2011, AccuWeather.com meteorologists warn that it only takes one major hit to the U.S. to have a huge and devastating impact. “People should take preliminary precautions and make preparations for hurricane season. Get a hurricane plan together and get hurricane supplies in order, such as materials to mitigate property damage. Make a family plan for evacuation, including what to bring,” Kottlowski said. The 1992 Atlantic Hurricane Season is an example of how overall numbers can lead to a false sense of security and one storm can break “hurricane amnesia” for places that have not had a direct hit in years. The tropical season started slow and there were low numbers of named systems in 1992. During the entire season there was one subtropical storm, three tropical depressions, two tropical storms and four hurricanes. This Sept. 4, 1992, aerial picture taken with a fish-eye lens shows the devastation left by Hurricane Andrew in Florida City, Fla. (AP Photo/Mark Lennihan). The first tropical storm of the season was named on one of the latest dates ever recorded, on August 17. That storm was named Andrew and later strengthened into a Category 5 hurricane before slamming into Homestead, Fla.
Andrew is one of the most infamous hurricanes to strike Florida, and the strongest hurricane to make landfall in the U.S. since Hurricane Camille in 1969. 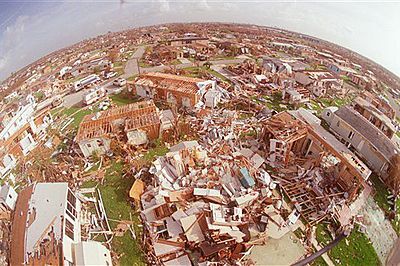 According to NOAA, Andrew caused $26 billion in damage and killed more than 60 people.